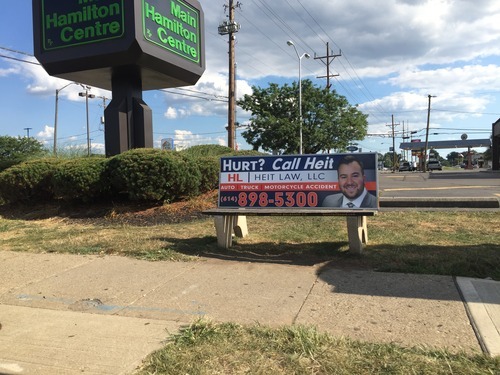 Recently, the personal injury law firm of Heit Law, LLC began an advertisement campaign on the east side of Columbus, OH. Motorists will notice that the law firm took out ad space at the intersection of Main St. and S. Hamilton Road in Columbus. The purpose of the advertisement is to draw attention to the firm in order to build a brand awareness and show motorists in Central Ohio that they have an advocate to help them in the aftermath of an accident. Heit Law dedicates their services to helping the members of the community who have been the victim of an automobile accident. It is always important to contact an attorney after an auto accident to make sure that all of your rights are protected. Even if you are unsure if you want to hire an attorney to help you, Heit Law can provide you with a free consultation to help you understand your rights and explain how you may benefit from our services. Remember, our firm does not take a fee unless we win your case. If you or a loved one are injured in an accident due to the carlessness of another driver, we are here to help. Hurt? Call Heit.